This is where TEPCO and subcontractors have been working on to build the foundation that would support heavy columns like the first two that were just installed on January 8, 2013. The foundation building work has been described by some as the evidence that the Reactor 4 building is collapsing. 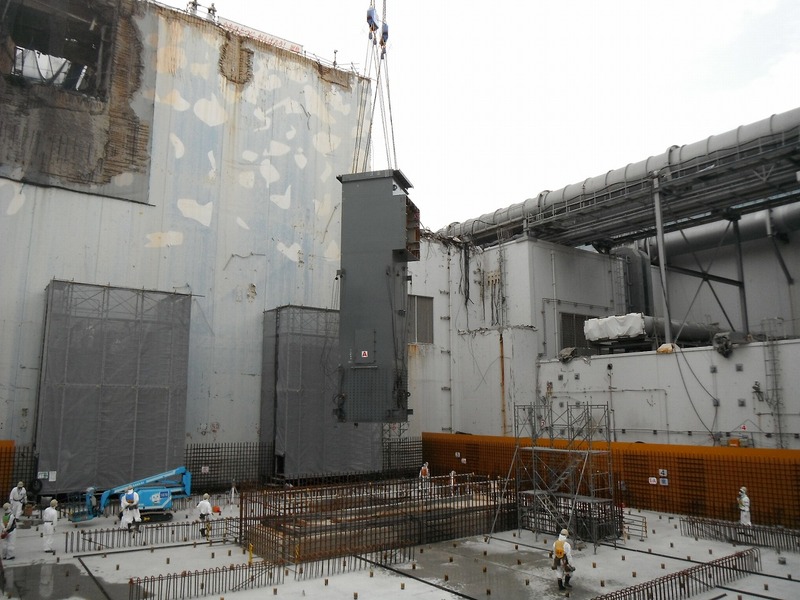 The steel frame over the Reactor 4 building that will suspend the crane to remove fuel assemblies will be completed by October this year, and TEPCO plans to start removing fuel assemblies from the Reactor 4 Spent Fuel Pool in November 2013, according to Mainichi Shinbun (1/9/2012). That will be one year earlier than previously planned. 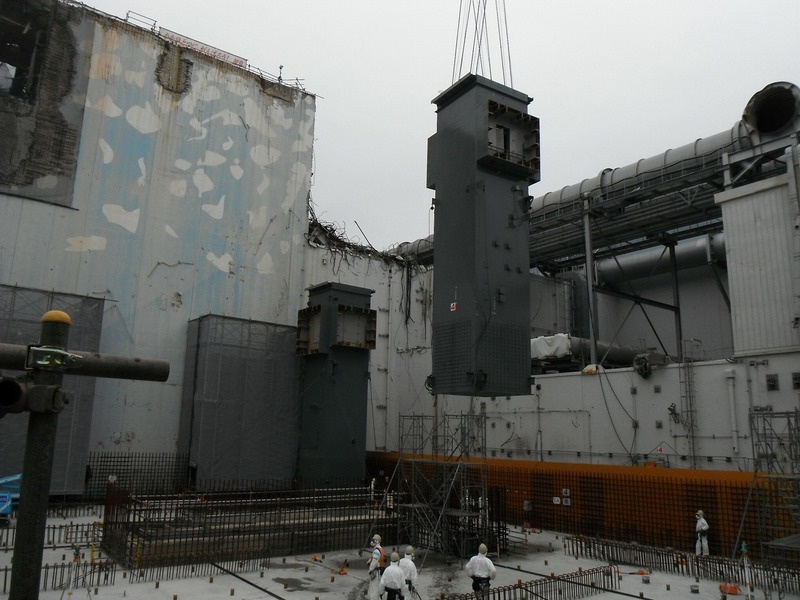 Look at all this damage, destruction and contamination....if TEPCO had only properly maintained the plant, built sufficient tsunami countermeasures, and adequate emergency power genearation.....none of this nightmare would be a reality. But will anyone face the consequences for the destruction of Japan? No, of course not. Criminals. I would be suspicious because it is very rare for any of these measures to be completed so far ahead of schedule. Generally when the nuclear industry accelerates any clean up it is for a reason and that reason is very, very rarely because everything is going so smoothly. I have to wonder why the haste the fuel is supposed to be safe I'd think they'd have more pressing issues. On the other hand maybe the LDP has decided they need a positive story coming out of Fukushima double quick to bolster their nuclear ambitions. Moving fuel assemblies is relatively easy to do in the face of all the other insurmountable problems at the facility. Emptying #4 SFP would give them the ability to refute the US NRC's early assertions that there might be a grave problem with the pool. If the fuel is found intact it will give the enemies of former NRC Chairman Jaczko ammo to dispute his credibility on other issues including his 50 miles evacuation advisory. Did anyone notice the scafolding is covered with nets because there are holes through the south wall of #4? The one on the right is below the fuel pool. Patching some cracks? The one on the left is around the corner from the truck bay entrance, they photo-shopped out. Not sure why they can't stack sandbags under the floor(s) supporting the SFP. That would surely remove the load from the structure. Indeed, for the money spent to recover the fuel rods alone they could have built at least one more reactor. "Washington, D.C. – After an onsite tour of what remains of the Fukushima Daiichi nuclear facilities decimated by last year’s earthquake and subsequent tsunami, U.S. Senator Ron Wyden (D-Ore.) a senior member of the U.S. Senate Committee on Energy and Natural Resources, sent a letter to Japanese Ambassador Ichiro Fujisaki looking for ways to advance and support clean-up and recovery efforts. Wyden’s principal concern is the relocation of spent fuel rods currently being stored in unsound structures immediately adjacent to the ocean. He strongly urged the Ambassador to accept international help to prevent dangerous nuclear material from being released into the environment. “The scope of damage to the plants and to the surrounding area was far beyond what I expected and the scope of the challenges to the utility owner, the government of Japan, and to the people of the region are daunting,” Wyden wrote in the letter. “The precarious status of the Fukushima Daiichi nuclear units and the risk presented by the enormous inventory of radioactive materials and spent fuel in the event of further earthquake threats should be of concern to all and a focus of greater international support and assistance.” "
Jalandhar is known to be one of the hot destination where you can invest in property. It offers various options for Residential Property in Jalandhar, Commercial Property and Industrial properties as well. It’s hard to find knowledgeable people regarding but you sound like you know what you’re talking about! Thanks for sharing this with others.